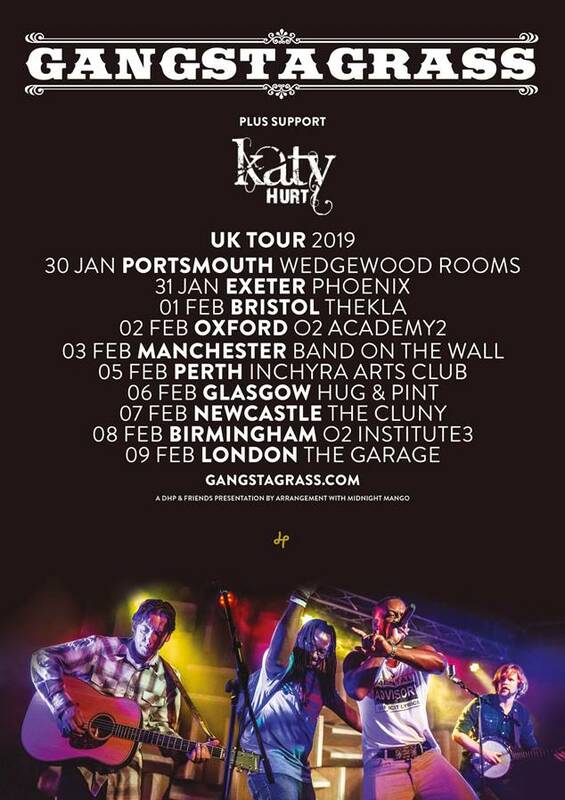 The incredible Katy Hurt kicks off 2019 by joining GANGSTAGRASS on their early 2019 UK tour! Emmy Award nominated GANGSTAGRASS combines Hip-Hop and Bluegrass. This fusion is the brainchild of Rench: a Brooklyn-based independent singer, songwriter, and producer, whose roots lie in honky-tonk and hip-hop. Katy says “I am extremely excited to be hitting the road with Ganstagrass this month! I’ve spent my whole life trying to merge my love of traditional country music with modern elements from artists in all sorts of genres I love and it is really inspiring to be able to see a band whose style and sound is such a unique fusion. I also cannot wait to venture into some new places and meet some new people, it’s going to be great!”. 2018 has seen Katy nominated for “Best Country/Folk Act” at the Unsigned Music Awards as well as performing festival slots at Country 2 Country, BlackDeer, Rhythmtree, Cornbury and many more. Heads-up for a rare chance to hear one of the most exciting genre-crossing fusions around: Gangstagrass, who’ll be coming to the UK and touring the country between 30th Jan and 10th Feb 2019. They’ll also be releasing a live album to be announced soon.